What Does “Fresh” Mean to Us? To some, “fresh” may mean improperly forward or bold. To others it may mean something that was recently made and obtained. 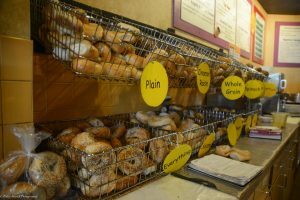 At the Bagel Bakery, fresh means that your bagel was a sack of flour yesterday, and a delectable start to your day today. It means that your coffee is no older than 48 hours. It means that the turkey that you love on your Gator Cub was sliced just yesterday so that your meal could be perfect. Don’t settle for old bread and pre-sliced meats, you deserve nothing but the freshest. That is what the Bagel Bakery strives to give you every day. Bagels were created to honor a king – We aren’t the only ones who obsess over delectable bagels, kings did too! Bagel history dates all the way back to 1783 when they were created to honor King John III Sobieski of Poland. According to popular belief, they were honoring him after he protected Austria’s people from an attack by Turkish invaders! Bagels are the only bread that is boiled before baked – Once the bagel dough is shaped into a circle, they are dipped into boiling water for three to five minutes on each side. After that, they are drained and baked for about 10 minutes. The most popular bagel choice plain – Though you may have imagined it to be an “everything” bagel or maybe a blueberry bagel, the most popular of them all is actually plain. The close runner-up is a sesame bagel. The word “bagel” has a meaning – The word “bagel” is derived from the German word “bougel,” meaning “bracelet.” So if you ever see a bagel that isn’t round, it isn’t technically a bagel. “Round with a hole” is a major part of the bagel’s identity. Bagels have made it to space – In June 2008, astronaut Gregory Chamitoff blasted into space with 18 sesame bagels within his cargo. The bagels came from his cousin’s bakery in Montreal. How does the Bagel Bakery brew such delicious coffee? 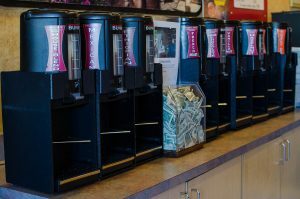 At least once a year, the owner of the Bagel Bakery, Ken Rembert, travels to Guatemala to import Rembrandt Coffee that is roasted in the store. Along the way, he gets to meet and interact with the farmers and their families. He donates money for water filters, eyeglasses, school programs and helps to provide computers to various programs there. He gets to see first-hand how the Bagel Bakery positively impacts so many lives in Guatemala. Recently, the Bagel Bakery has had two roasters and a wholesaler show interest in carrying our green coffee. That’s three more customers for the Bagel Bakery and Rembrandt Coffee, helping to make Ken’s efforts in Guatemala successful. So if you want to help expand this mission, all you have to do is drink our delicious coffee.